When the RHESSI satellite  observes a solar flare at different energies, some patterns become clear. At high X-ray energies – above about 30keV – distinct compact flare footpoints are visible, with a bursty time behaviour and a non-thermal spectrum. At low energies the sources are usually slowly evolving coronal loops with a thermal spectrum. The X-rays are produced by electrons, heated and accelerated in a solar flare, and we tend to interpret these observations as showing us two distinct electron components produced by two different – though related – processes. But is this really the case? Can we divide the flare electron distribution neatly into a slowly varying thermal component and a rapidly varying, non-thermal component or is this two-component model an over-simplification? We will examine this in a simple solar flare, using spectra and lightcurves from RHESSI, focusing on trying to determine an energy at which the flare flips between these different types of behaviour, and testing whether this energy is the same when examined in space, time and spectral domains . 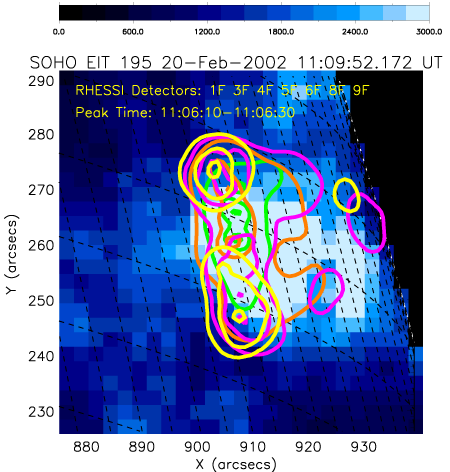 Figure 1: SOHO/ EIT 195 A images of post-flare loops with the impulsive-phase RHESSI HXR source positions superimposed. The RHESSI contours show 6-9 keV (10, 50, 90% in green), 9-12 keV(10, 50, 90% in orange), 12-25 keV(5, 20, 60% purple) and 25-100 keV (2, 10, 50% in yellow) respectively. Figure 1. shows a composite RHESSI X-ray image, exhibiting the usual high energy footpoints and low energy looptop, but at energies in between – from about 10 to 25 keV – the emission appears to have footpoint sources but also clearly has some loop emission. Spatially the picture is mixed: it is not possible to clearly distinguish the thermal and non-thermal aspects of the flare from images. 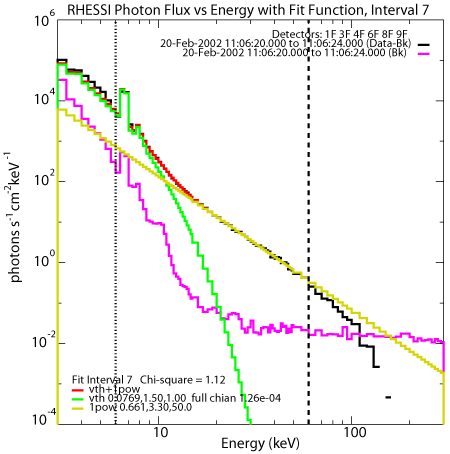 Figure 2: Rate of change of semi-calibrated photon flux versus photon energy for different 4 second time bins. Each curve is fitted with two straight lines. Error bars are obtained with a Monte-Carlo approach, adjusting the error bars on the data within their statistical limits and repeating the calculation of the derivatives. If it is correct that there are two distinct electron populations in a flare, one being high energy, rapidly changing and non-thermal, and the other being low-energy, slowly varying and thermal, then it should be possible to distinguish them on the basis of their time evolution, by looking at the time derivative of the X-ray intensity at each energy (i.e. the derivative of the energy-dependent light curves). This will have a high value for impulsive X-rays, and a low value for gradual X-rays. 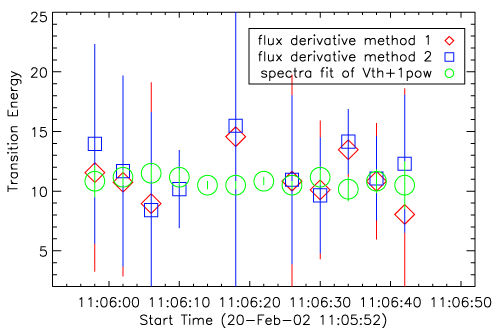 In Figure 2 we show the time derivative  as a function of energy at different times during a small flare, which occurred on 20 Feb 2002, close to the beginning of the RHESSI mission. As can be seen, the time derivative has a small value and is quite constant up to around 10keV. Then it increases, showing that the electrons have become ‘impulsive’. The observations have been fitted with two straight lines intersecting at the energy where behaviour changes from gradual to impulsive. It is rather hard to say exactly the energy at which this happens – the uncertainties on the energy at which the two lines cross are typically a few keV wide. Note, it turns out that the functional form of the fit describing the time evolution is also a consequence of a thermal/non-thermal spectral description (see ). It is usually possible to fit X-ray spectra with the two components mentioned above; a thermal ‘core’ and a non-thermal ‘tail’. An example of such a spectral fit made in photon space, at the peak of the flare, is shown in Figure 3. Of course, a spectral fit is just a model, and need not represent all aspects of the actual plasma. However, this model makes it possible to write down a simple mathematical description of the electron distribution, which has as one of its parameters the energy at which a transition between thermal and non-thermal behaviours takes place. Our question is then the following: is this energy found by spectral fitting the same energy at which the transition takes place between gradual and bursty time behaviour? Figure 4 shows the comparison of the transition energy between thermal and non-thermal behaviours at different times during a flare, and between gradual and impulsive evolution at those same times. So, the answer to our question is ‘yes…..but….’. Yes, the energy at which the transition between thermal/non-thermal, and between gradual/bursty takes place is consistent, within error bars, but as can be seen on Figure 4 the error bars are very large. So we can’t really claim that it is the same energy, nor to understand whether this transition takes place at a single energy or across a range of energies. So we have to work on ways of reducing those error bars. This will involve looking at larger, but still simple, flares with better photon counting statistics (quite a challenge to identify, as large flares tend to be complex), and examining larger samples. At this point, we have shown that two-component model of a solar flare electron population has passed the test, but only at a grade C. Our analysis has not tied down what is going on between about 10 and 20 keV in the transition region between two different types of behaviour. So it is still possible that there is a continuous electron distribution evolving smoothly from thermal into non-thermal characteristics. In some ways a continuous distribution makes more sense: one of the consequences of the two-component model is that to keep the total energy finite it is necessary to arbitrarily impose a low-energy cutoff to the non-thermal distribution, and there is no theoretical reason why this should happen! So this study has opened some interesting observational and theoretical avenues, and we hope that further studies with RHESSI and complementary data will help tie down the nature of the entire flare electron distribution, and thereby lead us to a deeper understanding of the acceleration process. 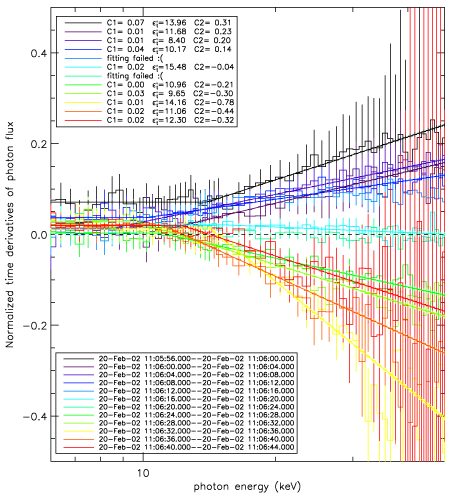 one of our method for finding the derivatives uses model-dependent fitting of fully calibrated data, the other uses a much faster, model-independent analysis of semi-calibrated photon data. Results are consistent for these purposes.